Time for Stretch Tuesday again! Since this is a crazy time of the year for everyone with all of the festivities of the Holiday Season underway, Stephanie from the SGS (Stretch Glass Society) suggested to us that “Kissin Cousins” would be fun. What is “Kissin Cousins”? “Kissin Cousins” is putting together Stretch and Carnival Glass. Don’t know about you, but we seem to be looking to complete sets in carnival and stretch glass, so this might be a way to solve those situations! The picture above shows a red Dragon and Lotus bowl flanked by white United States Glass Company hollow candlesticks #151. The one on the left shows the panel optics and the one on the right is plain. The candlesticks are weighted so that you can also use them as vases. The set is beautiful on a console table together. They are “Kissin Cousins”! Both of these pieces would have been great to use on your Halloween table. First picture is a Diamond Egyptian Lustre (black opaque) cracker (potato chips) plate with an embossed ring in the center for a cheese dish. The U.S. Glass Cosmos and Cane spittoon shaped compote in marigold fits in the center perfectly and could be used for a cheese dip. The second picture has Fenton wisteria 10 ½”high candlesticks with a marigold Curved Star epergne. Wouldn’t cookies look good on the plate part of the epergne and some flowers in the vase? Perfect centerpiece for the dessert table. 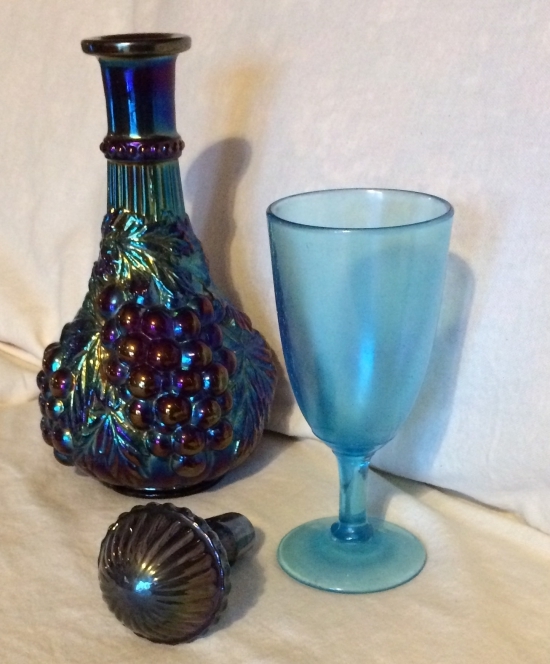 The third picture shows an amethyst Imperial Grape wine decanter and stopper with a Diamond Harding Blue goblet. The goblets are found in the east (so we are told), but rarely found in the West. 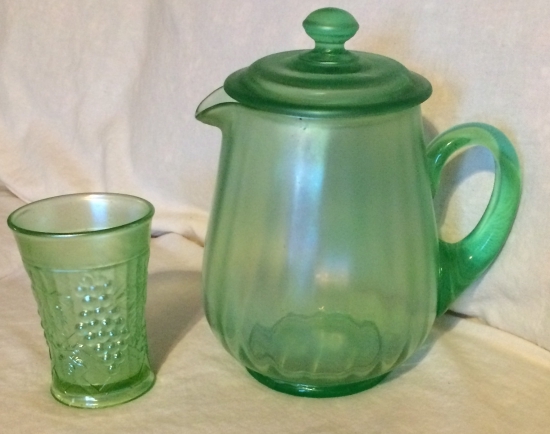 The second picture is of a Northwood Grape Arbor tumbler in ice green with a Diamond lidded optic rib pitcher in ice green. Would love to find the ice green Grape Arbor pitcher. 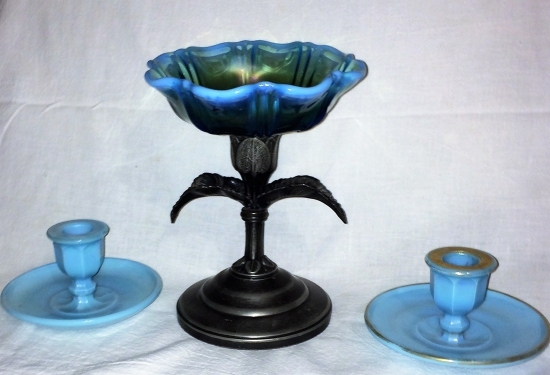 The Fenton Royal Blue candlesticks compliment the blue Fenton Thistle bowl. 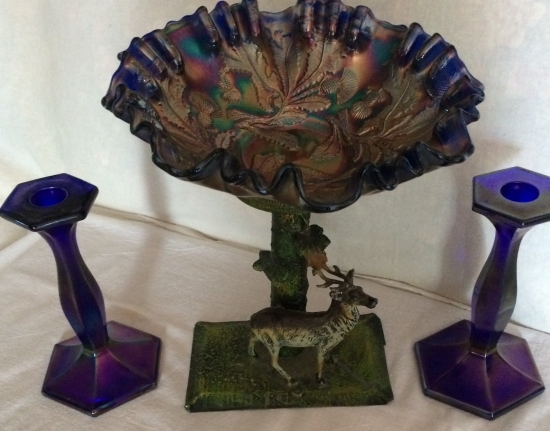 Some decorator (doubt if it was done in the Fenton factory) had fun attaching the bowl to a metal stem and base with a deer statue. Another compote with a metal pedestal has Westmoreland’s Two Seventy pattern which normally is a compote, but someone cut the stem and foot off so it would fit in this metal stand. The candlesticks are Northwood’s small saucer Jade Blue candlesticks. 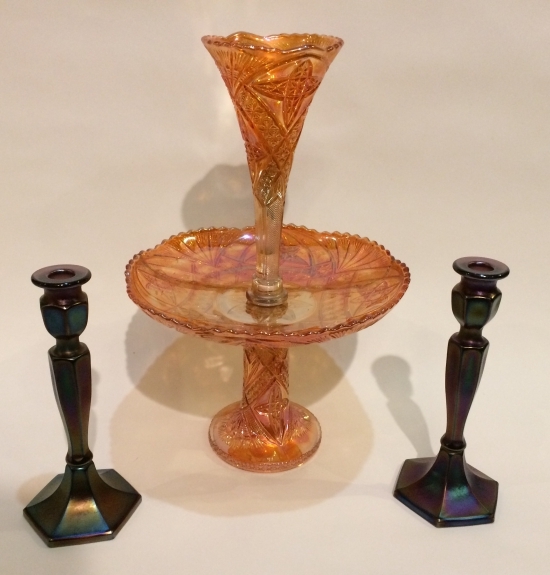 These pieces are “Kissin Cousins” when you add the stretch glass candlesticks! The Fenton white Orange Tree punch bowl and cups look terrific on a Fenton Ruby Red punch bowl base. The very old lady that we purchased the Orange Tree pieces from said that her mother purchased the set for her wedding gift. The pieces were in a barrel when the merchant purchased them from Fenton. So he put the white punch bowl on a blue Orange Tree base. So that is how the punch set lived a many years in the lady’s china cabinet. We have kept the set together in that matter for many years ourselves. But I must say that the bowl looks very striking on the red base especially for the Christmas season. Another beautiful “Kissin Cousins” punch bowl set. 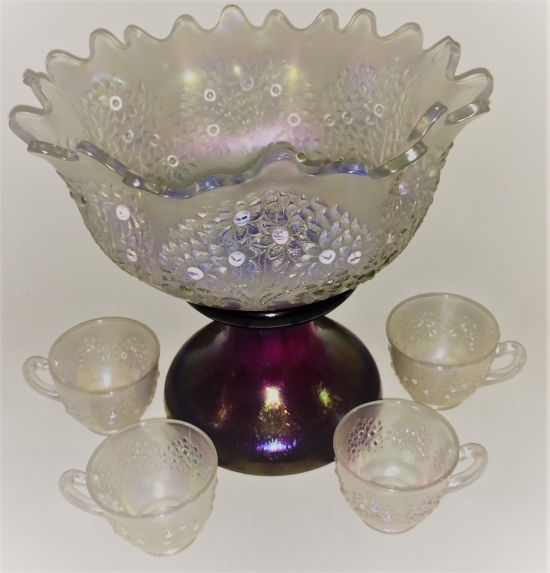 We have a carnival glass punch bowl base collection (always hoping to find the punch bowls to go with them) so am considering using stretch glass bowls on the bases! 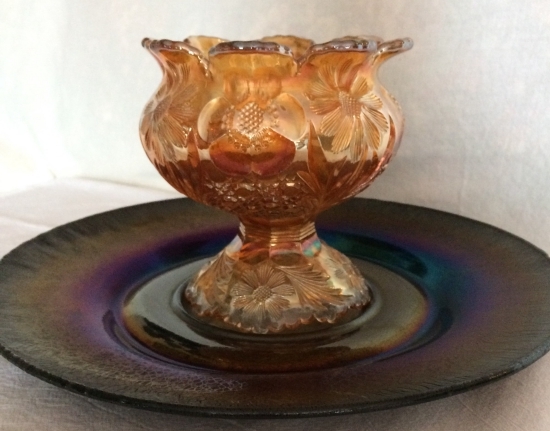 Unfortunately stretch glass punch bowls as well as the pedestals are hard to find and pricey! Playing around with the carnival and stretch glass has been a lot of fun; a real learning experience. They really are “Kissin Cousins”! Thank you Stephanie for the idea. Galen, you asked what we would like to have under the tree on Christmas day; the amethyst twisted compote that Carl Booker pictured last week. We have never seen one like it in stretch glass. Imperial had a large number of Heisey and Cambridge molds. Then when Imperial went out of business, Frank Fenton purchased as many of the molds as he could. Frank didn’t want the molds to go to China! That is a story in itself! Must say that throughout the years Carl has found some of the nicest pieces of stretch and carnival glass that we have ever seen. Now that you have your 2017 calendar, we're doing a seminar at the Southern California Carnival Glass Convention in March. Would love to have everyone join us. The weather is always nice and warm (no snow). This is a fun convention with an open house that will show off a lot of beautiful carnival and stretch glass.